Whiff is a buff bouncer who can be seen manning the door at many establishments like Club Atomic and RockJaw Concert Club. 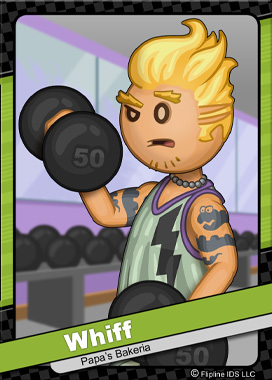 He spends a great deal of time lifting weights at the local Fit Frenzy Gym. Afterwards, Whiff wanders over to Papa’s Bakeria where he bulks up on freshly baked pies. Weekly, He travels to Tastyville to hang out with his long-time girlfriend, Mindy. As you could guess, she is responsible for Whiff’s rather unique hairdo.